With its flat design and clear cap, this test card can be photographed without fear of contamination by the tester's work area. Positive: Colored lines appear in the control regions (C) but do not develop in the test region. 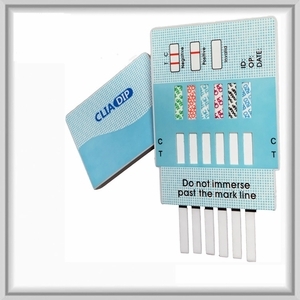 The absence of any line in any target drug test region indicates a positive result for that drug. Negative: Colored lines adjacent to each target drug name and in the control (C) regions will appear. The color intensity of the line for the target drug may be weaker or stronger than that of the control line however any line, no matter how faint should be interpreted as a negative result. Invalid: No line appears in the control region. If the control line (C) does not form, the test result is inconclusive and the test should be repeated with a new device.